Description: 41T rolls west into the late afternoon sun as it passes the ever present cornfields along the route. Todays train is 63 cars, and is now only 75 miles from a hand off to CN at Buffalo. Description: CN 5786 SD75I leads a mixed freight down the IHB Mainline. Description: Q621 westbound at Amsterdam. Now in 2018, 621 is now 620 and vice versa. Description: CSX Q621-16 crosses Main St. at MP 73. Description: W/B Coal train along the Thompson River at Savona, BC. While fisherman enjoy the warm weather. Description: CN 5786 coal train rolling along the Thompson River, while a CP intermodal motors upriver. Description: Southbound manifest train pulls up the mainline at South Itasca. 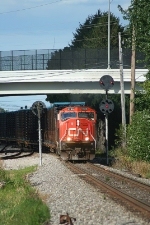 Description: CN 5786 leads an autorack train around the connection from the former DT&I mainline on to the Ann Arbor at Diann, Michigan. Description: 405 heads onto the large fill at Fundy, a few miles from its destination of Gordon Yard in Moncton. Description: CN 5786 leads northbound NS 357 through Attica. 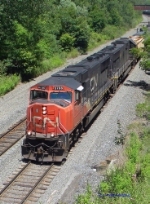 Description: CN 2416 trails on NS 357. Description: On a blustery January morning CN 5786 - CN 5621 kick up the snow as they round the bend by the Market Street crossing with 101 cars in tow. Description: K693 in the Batavia cut. Description: Nice for a change to see CN power. Photo was taken along Buffalo St. Ext. at Milepost QC 389.